Follow the links below to listen to each podcast. Or listen from our player. Scroll to the bottom to read more about the hosts. Three generations of Christian Women share their thoughts about different issues and aspects of life. Also Introducing the Creative Christian segment of the Inspirations podcast. You can search our podcast by subject from the blog. 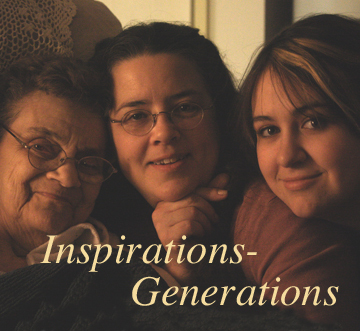 The Hosts of Inspirations/Generations podcast are: God’s Word Collectible sculptor, Bridgette Mongeon, along with her daughter, Christina Diliberto in Tulsa, and her mother, Barbara Ingersoll in New York.Three times a month they get together and share inspiration and hope with other women as well as interview some pretty remarkable guests. This podcast has something for every woman—no matter what her stage of life. My goal is to reach out to other women where they are hurting. That through our experiences, they may gain strength and hope. Barbara is referred to on the podcast and by her listeners as "Gram." Her life is a testimony of the grace of God. In her early years, Barbara wrestled with a drug and alcohol addiction. At 30 she came to know the Lord while visiting Buffalo Christian Center with her daughter. Sobriety and spirituality was her new commitment. She documents those years prior to sobriety in a five part testimony "Through the Darkness," that she has recorded with her daughter, Bridgette. (See podcasts below). Together they share the spiritual bond that has been there all their lives. After becoming sober Barbara had a great desire to help other women who were hurting. In fact, that has been her goal for 40+ years. She began her ministry by leading support groups for hurting women, and then learned there were more hurting women than one group could handle, and so she trained support group leaders. Now home bound, Barbara had thought the days of ministering were over. How could she minister if she could not physically get around? Today she does so from her fluffy marshmallow chair in her assisted living facility. Her frame is nearly swallowed by the chair as she talks on the phone passing on wisdom to her daughter and granddaughter, and then to all the listeners of the podcast. Barbara loves to paint watercolors and is an avid journaler. She was very involved in Woman's Aglow in the 80's and 90's, and was even vice president of Woman's Aglow, Western New York Chapter. She has previously been a member of New Covenant Church in Tonawanda, New York and Full Gospel l Tabernacle in Orchard Park, New York . She now attends The Chapel at Crosspoint. when she gets a ride and her health permits. 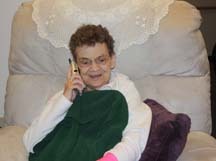 On August 17, 2009 Barbara Ingersoll co host, mother and grandmother went home to be with the Lord. She will be greatly missed. Before going home her daughter and granddaughter assured her that this ministry would continue. Barbara journaled most of her life and with those journals the generational blessing of the podcast continues. Continuing in the ministry is a way for Bridgette and Christina to honor their mother and grandmother. Having her words, her pain, her faith in God to sustain her continue to help hurting women is also honoring Barbara Ingersoll. If you were helped by Barbara we would love to hear from you. So many lives were changed by her being on this earth. Please pass the word about her ministry. One of her last journal entries states, "I proclaim to all the earth and all powers and principalities that these are healing podcasts— no matter where you ar in your walk with the Lord... however far you have come in your journey." Barbara Ingersoll July 17, 2009 You can hear Barbara minister in most of first 38 podcasts. It is the greatest desire of my heart that the Lord will use everything in my life, my past, my art, my writing, everything to help others, to inspire and give hope. Use us Lord. Bridgette is known as "The meat and cheese," or the sandwich part of the Inspirations/Generations podcast. Bridgette's strength comes from the grace of God that brought her through a childhood filled with alcoholism and drug abuse. Even though Bridgette left home at 16, she had a strong desire to improve herself and to heal the relationship between mother and daughter. Because she came to know the Lord in her teen she has always had a heart for the youth who are hurting. She ministers to others through creative means. 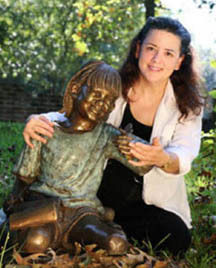 She sculpts portraits in bronze, and has sculpted many famous people, but her favorite thing to sculpt are posthumous sculptures. She enjoys the opportunity of co-creating with her clients, while assisting them through the grieving process. She writes for magazines and has been a coauthor of a couple of books and is presently working on several children's books. These children's book project are geared to her hearts desire of helping children to be emotionally and spiritually healthy. She is also the creator of the God's Word Collectible gift series, the sponsor of the Inspirations/Generations podcast. 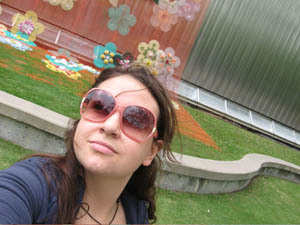 She lives in Houston, Texas with her husband, son, two dogs, and a pond filled with fish and her turtles. She has a strong desire to pass on hope, encouragement and inspiration to others which she does through the podcast as well as her other creative endeavors and speaking engagements. She has been a member of St. Alban's Episcopal Church for 25 years, where she teaches Sunday school and sings and plays the guitar on the worship team. She has also been a worship leader at St. Mark United Methodist Church in Houston, Texas and frequented Congregations Beth Messiah . I love doing the podcasts. It's been a great way for me to grow closer to my mom and grandmother. My greatest hope is that we help one person. If we can help one person with our advice or experiences, I know I've done my job. Christina is the youngest of the inspiration/Generations podcast, but only in years, not in wisdom. She is a graduate of Oral Roberts University with a degree in Advertising and Public Relations. She could be referred to as a spiritual mutt, growing up she went to church with her mom at St. Alban's Episcopal Church on Sundays, visited Beth Messiah on Saturdays, and went to a youth group at Lyndale Assembly of God on Wednesdays. She attended Our Savior Lutheran School until the 8th grade where she was accepted into The High School For Performing and Visual Arts. She is marrying a fellow Oral Roberts University Alum William Siezmore. The two will be teaching during the school year and are praying about leading youth missions trips together for the summer months. In her spare time Chris pursues her photography, graphic desing and writing. The podcasts can be found on the God’s Word website at http://www.godsword.net. From the God’s Word website you can downloaded and subscribe in iTunes. Here is a sample of the Inspirations/Generations Podcast.